There’s a Dutch version (pdf-file) of the pattern also, just click here; the English pdf-file can be downloaded here. 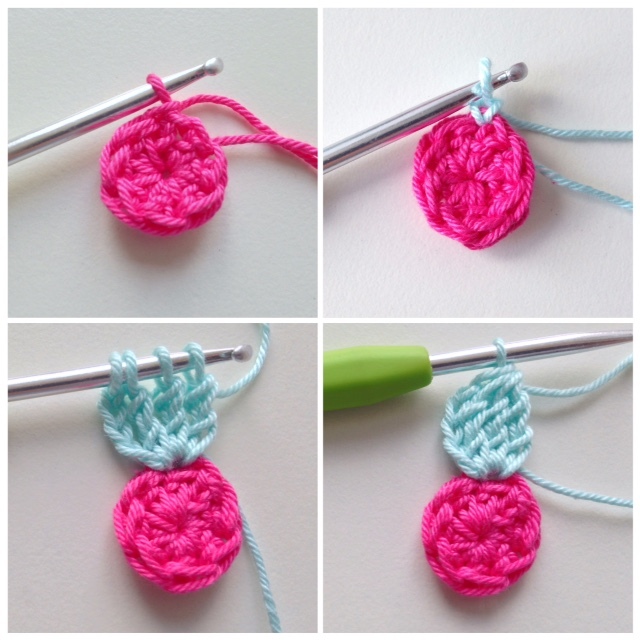 Round 1 (color 1) – make a chain of 4, close with a slip stitch to form a loop. Round 2 (color 1) – chain 3 (= first double crochet), crochet 7 dc’s. Slst in top chain of your first dc (= the 3-chain).Total of 8 stitches/dc’s – fasten off – change to new color. Round 3 (color 2) attach yarn with slip stitch in any st of previous round – * chain 3. In same stitch: 3 triple crochets, making sure you leave the last loop of every trc on your hook, thus making 1 cluster of 3 triple crochet stitches. When 4 loops on hook, draw yarn through all 4 loops, chain 3, slip stitch (still in same stitch from previous round): first leaf is done! Now slst in next stitch, repeat from * 7 more times. You should now have 8 leaves – flower is made! Fasten off – change to new color. 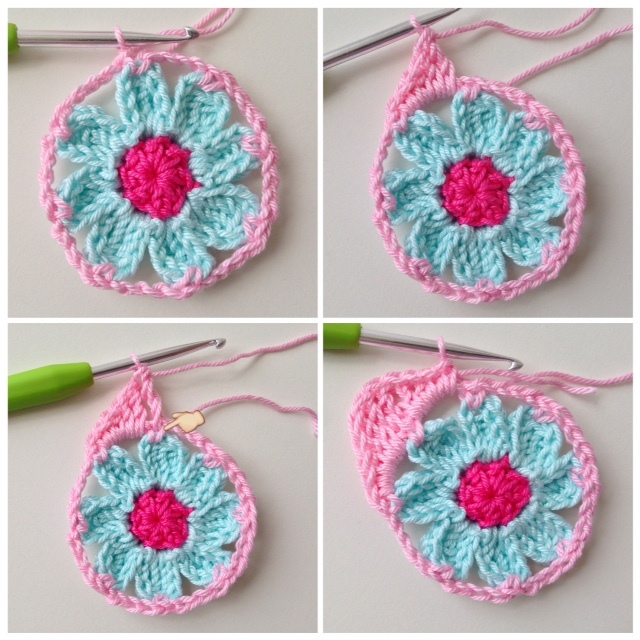 Round 4 (color 3) – start with a * slip stitch in top stitch of flower leaf. Chain 4, repeat from * 7 times. Slst in first st from this round. Round 5 (color 3) – slst in first space from where your hook is now, and then: sc, hdc, dc and a trc. Crochet a trc in the “v” you’ve made in the previous round. Then in the next space: trc, dc, hdc 2 sc’s. First corner made. Repeat 3 times (2sc, hdc, dc, trc – trc in “v”, trc, dc, hdc, 2sc). Slip stitch in first slst. 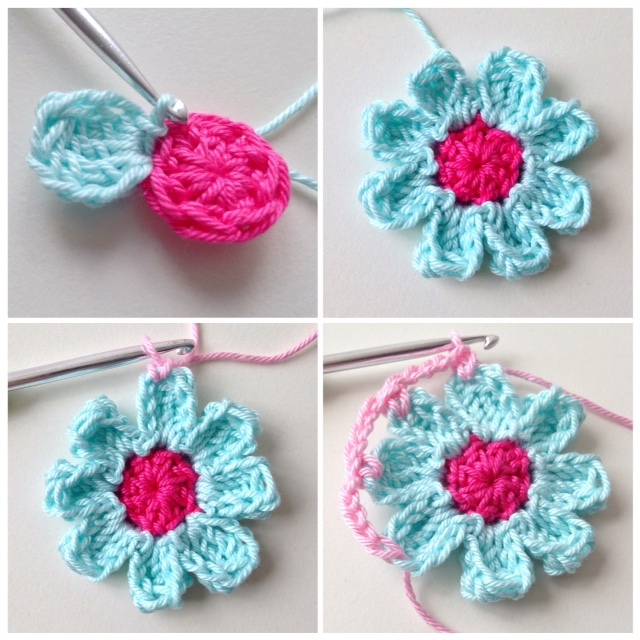 Round 6 (color 3) – crochet 3 chains (first dc) and continue with 1 dc in every stitch. 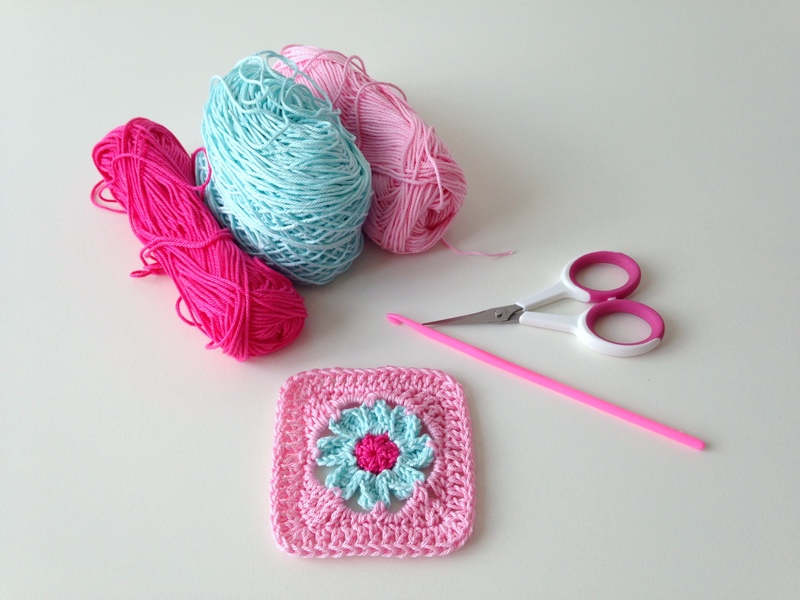 In the 2nd trc (the one you crocheted in the “v”) you crochet 4 dc’s – this is your corner. 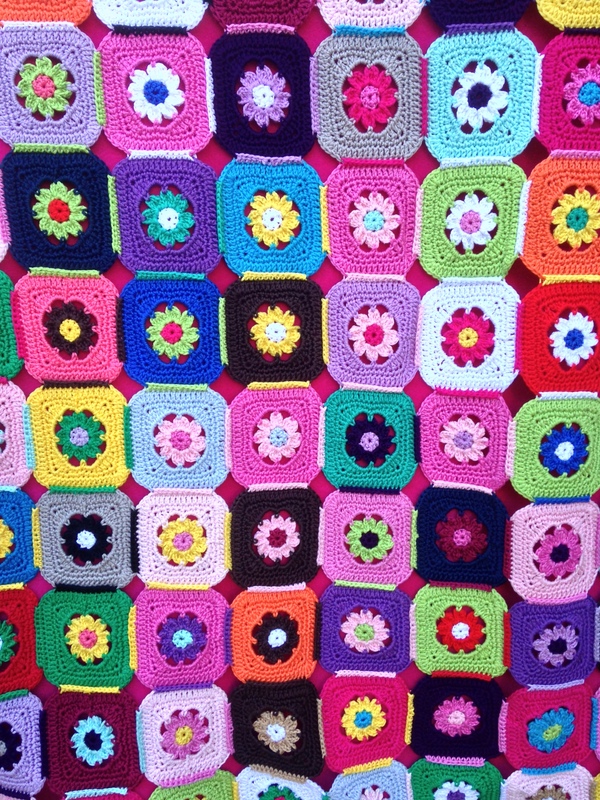 Crochet all around – on each side you should have 10 dc’s, and 4 dc’s in the corners – leaving you with a total of 56 stitches. 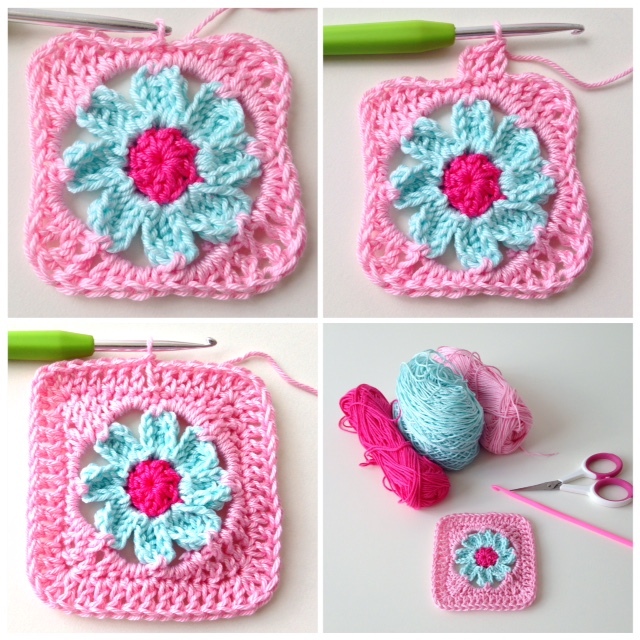 Slip stitch in first dc (the top of the 3 chains you started this round with), fasten off, sew in ends and ….. admire your work: you’ve just finished your first “rose”-granny square! As for the joining of these squares, I did something unusual back then, simply because I had no clue (yet) of all the different joining techniques that are out there. 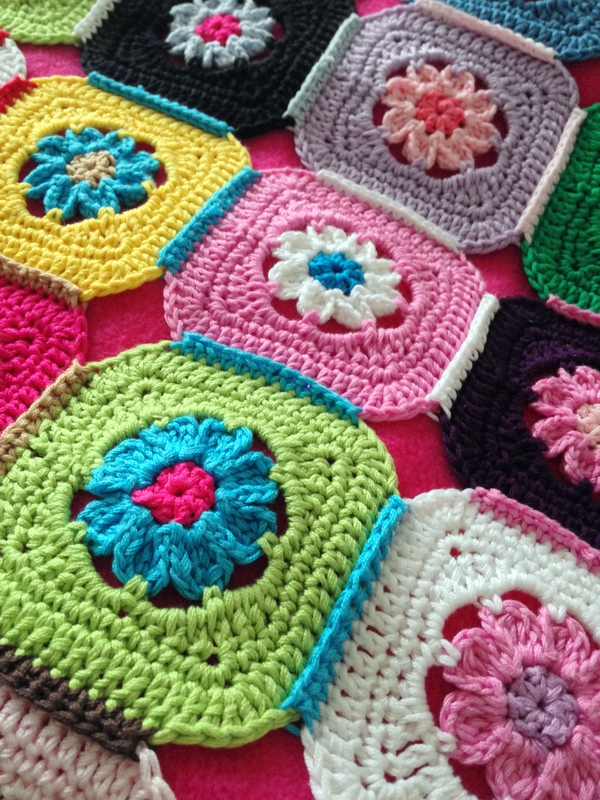 After I had laid out all of my squares, I started joining in rows – connecting square A to square B, by crocheting (sc’s) the 10 stitches alongside of each square together. Trying to bring some sort of logic to the whole process, I decided that the joining color for two sides of each square would be the same color as the one used for the flower of square A. It’s not a “technique” I would easily use again (so very time-consuming, so many extra ends to sew in), but I have to admit that I still like the result. After all the squares were joined, I just free wheeled a border in simple sc’s and I cannot remember why, but I chose to put a fleece back on the blanket and join the fleece and the crochet part like you would when making a quilt. For the binding I picked a bright/light blue flowery fabric. As to the new “rose”-grannies that I have recently been crocheting, I’ve opted for a different kind of joining technique, the flat braid join. 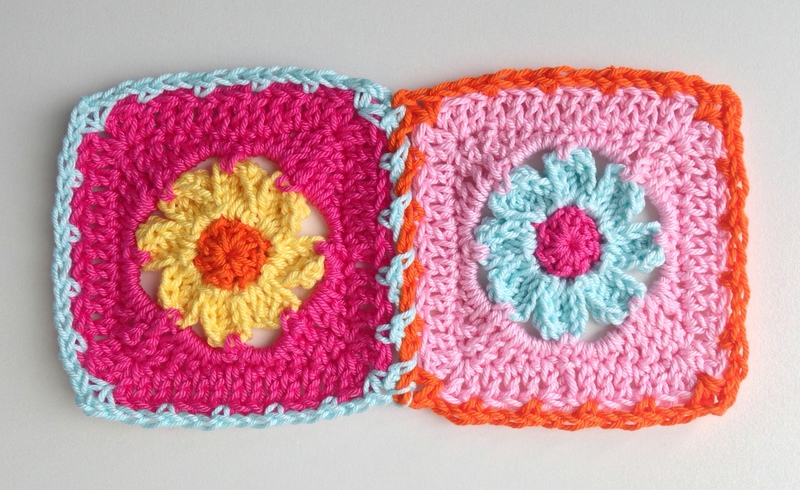 In the corners of each square, you crochet 1 sc, chain 1, 1 sc and along the sides of the granny you crochet 2 chains, skip 2 stitches, 1 sc until you reach the next corner. When you’re ready to join your square with the next one, this is what you want to do (or maybe one of these – fun too). Je m’appelle Martine, j’ai découvert votre blog sur Pinterest. J’aime beaucoup ce que vous faites, mais il n’y a pas de traduction en français. Il m’est difficile de comprendre. Y’aurait-il un moyen d’avoir une traduction. My name is Marianne Dekkers-Roos. I live near Amsterdam, The Netherlands with my husband, our 2 teenagers, a dog and a cat. 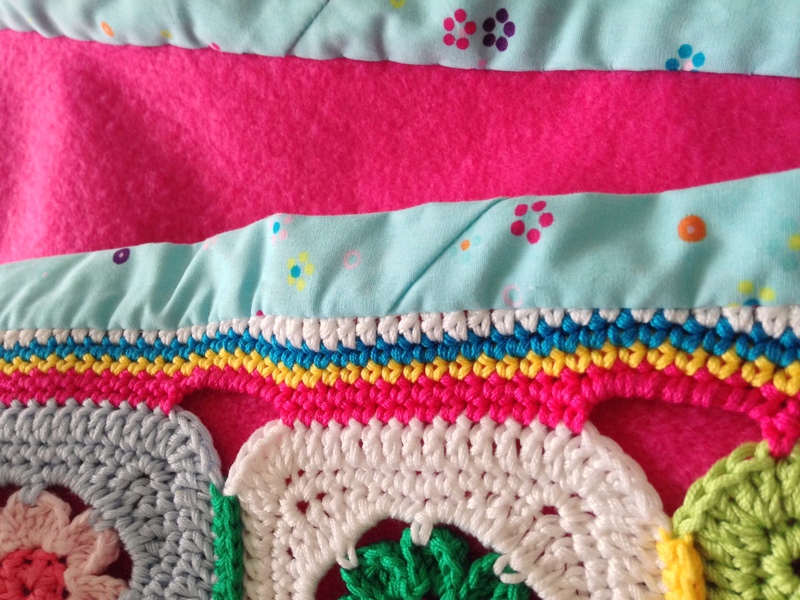 I love to crochet, knit, cook/bake, quilt/sew, well anything crafty that tickles my fancy. This is the place where I like to share the projects that did just do thàt! Something new on my hook 💛 Happy long weekend everyone! copyright 2013 - 2016 - Marianne Dekkers-Roos/All rights reserved The content and pictures on this website are the property of Marianne Dekkers-Roos, unless otherwise stated. If you wish to use any of my pictures (or words), please credit this site as the source and link back to the site and/or the original post. Link with love - thank you!